After several big heavy meals over the long weekend, I was ready for something quick, easy and light. This chicken orzo soup came through (as it always does). I have been making this soup for a long time, tweaking the recipe here and there over the years. 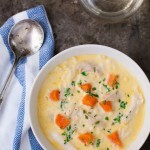 The original recipe was not even for a soup but chicken breasts served in a light creamy broth. I always felt the broth was the best part so I adjusted the recipe to be a soup, increased the amount of carrots to up the nutritional value and replaced the sautéed chicken breasts with shredded rotisserie chicken to make everything come together more quickly. You might not consider a soup with cream in it to be light. However, there is only 1/3 cup of cream and it gets divided among 4 servings. It is just enough to add some richness to the soup without blowing your calorie intake for the day. Melt butter in a large saucepan over medium heat. Add green onions, carrots, and garlic to pan; sauté 4 minutes or until carrots begin to soften. Stir in white wine and cook for 2 minutes. Add broth, salt, and pepper. Bring soup to a low simmer then stir in cream. Simmer uncovered over medium heat for 5 minutes. Add shredded chicken and cook until heated through. Divide orzo and soup among 4 soup bowls. Sprinkle each bowl with chopped parsley, if desired. Recipe adapted from Cooking Light, April 2000.